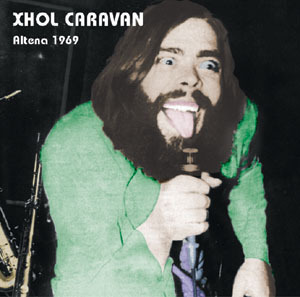 Xhol Caravan's 1969 studio album Electrip is one of Krautrock's enduring classics. The band began as Soul Caravan, which featured African American vocalists James Rhodes and Ronnie Swinson. It's not surprising that the earlier material by this incarnation of the band was much more soul and R&B influenced than the experimental free jazz psychedelic rock combo they would morph into as Xhol Caravan. The first of these two live releases from Garden of Delights finds the band in a transitional stage. 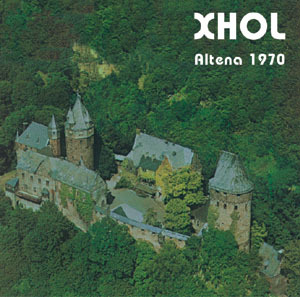 Altena 1969 predates the recording of Electrip. While Ronnie Swinson had left, James Rhodes was still in the band. On this extraordinary (and very well recorded) document the band has clearly moved on into stranger territory, the sound they would develop for Electrip, but the presence of Rhodes still lends their performance a touch of the old R&B sound of Soul Caravan as well. The showpiece of the album is definitely the nearly hour long Freedom Opera. Completists should note that this is the same recording of Freedom Opera that appeared on Motherfuckers Live (even though MFL says it's a performance from 1968), but here of course, we get more of the same concert, including four songs totalling 23-minutes. Things kick off with Olé, an excellent cover of the John Coltrane classic. Saxophonists Tim Belbe and Hansi Fischer were clearly greatly influenced by Coltrane, but the band here brilliantly takes the jazz number and transforms it into a sensuous rock jam, with plenty of Hammond organ and some mesmerizing grooves. So Damn, So Down and So Blue (originally the B-side of their first single), as its title would suggest, finds the band in slow bluesy mode, with James Rhodes providing soulful vocals. It's followed by Psychedelic Sally, a rockin' version of the Horace Silver jazz tune. And finally, we have the classic sounding original R&B of Emptiness. Rounding out the disc, or more precisely, filling out most of it is The Freedom Opera, a monstrous amalgamation of a number of tunes, many originals, but also a few covers, that blend and melt into each other. From the awesome experimental jazz rock fusion meets surf rock of Acapulco Gold, to a searing cover of Donovan's Season of the Witch, to James Rhodes' cries of "get your mind together and be real people" as he leads the band into the raucous and infectious Soul Caravan tune African Song with its trippy drum and flute interlude, the band takes the listeners on a non-stop, wild and incredible journey through rock, jazz, psychedelia, experimental freakiness and R&B grooves that's full of energy and power. Worth the price of the CD alone. You can definitely hear the seeds of Electrip germinating here in this terrific psychedelic odyssey. James Rhodes would leave the band some time after this concert, the band would record the seminal Electrip, and then change their name to simply Xhol (apparently to avoid confusion with the British Canterbury group Caravan). It was under this guise that the band recorded another live gig in Altena in 1970. By this time, the band had moved more into pure jazz rock territory, jettisoning the vocals and psychedelic flourishes for a more conventional, but still highly enjoyable listen. Consisting of three lengthy tracks (two of which clock in at well over 30-minutes each), the CD is a pretty full 80-minutes of music (one 20-minute long piece was omitted from the original concert as it couldn't be fit on the disc). I Can't Wait finds Hansi Fischer focusing more on flute, giving the swingy, funky groove and very period jazz feel for the early 70's. It's a little more subdued that the stuff on Altena 1969, and doesn't quite have the freakiness of Electrip, but it's still some great jazz rock fusion. The other lengthy cut, Xholenium is perhaps a touch more freakier than I Can't Wait, beginning with some raucous free jazz sax squonking before the rest of the band joins in. There are some definitely freakier, more experimental passages on this piece, more akin to the stuff they played on Electrip. Speaking of Electrip, sandwiched between these two lengthy cuts is a 9-minute version of Electric Fun Fair from that album. Without the singing and crazy poetic interjections of James Rhodes on Altena 69, Altena 70 may make for a bit of a tedious listen for some, but fans of extended, early 70's jazz rock fusion are sure enjoy this. So, although only recorded a year apart, these releases are quite different sounding, and show us a band in constant change and evolution. It unfortunately was not to last much longer as the band dissolved in 1972. They did however reunite in the late 1990's and early 2000's to play some gigs before, sadly, Tim Belbe passed away in 2004. These two discs, however, are excellent documents of the time before, and the time just after the classic Electrip was released, and present two different sides of the band in their prime.